The electrochemical activity of neurons allows it to respond to a stimulus in one millisecond . This responsiveness allows a large number of neurons to emit action potential synchronously in response to external stimuli. Thus, originally Siever  and Vieira  said that the use of modern technologies based on the reactivity of the brain to specific stimuli may be used to achieve cure and prevention of certain diseases, such as Parkinson's and Alzheimer’s diseases through technologies such as brain stimulation, which is based on the production of brain waves through light and sound stimuli. Specifically, the brain stimulation analyzed in this study uses equipment with sunglasses fitted with LED lamps in the inner face of the lens, headphones and an electronic device capable of sending synchronized visual and auditory stimuli in a specific frequency. The visual stimulation occurs through strobe lights, and auditory stimulation is made by binaural beats. These two techniques may be combined and enforced on the nervous system at frequencies that can range from 1 to 30 Hz producing states of consciousness compatible with the brain waves delta (1-3 Hz), theta (4-7 Hz), alpha (8-12Hz), and beta (13-30 Hz) [4, 5]. Calomeni et al. put the technology of brain stimulation by light and sound between the biofeedback techniques as it allows the individual after a period of training to develop the ability to produce mental favorable states to performance in specific situations. This theory is enhanced by Vieira , who defines the biofeedback as an immediate return of information through sensitive electronic equipment able to capture sensory responses amplifying and transforming physiological reasons in signals. In this context, the synthesis of brain waves fits this definition because this technology is able to stimulate the brain externally, to the brain to principle follows the frequency imposed, and after producing the desired brain waves. In this sense, studies based on photo stimulation that highly corroborate with the possibility of brain waves can be induced through externally stimulated frequencies, and these frequencies can change the state of consciousness  depending on external factors such as time of stimulation, culture, and expectations of the individual who will be stimulated [5, 7]. Regarding auditory stimulation through binaural beats, França et al. says that the brain’s response in relation to the applied frequency is doubled. To Calomeni et al. , the theoretical basis that guides the technique of brain stimulation by light and sound is structured in hemispheric balance and equalization of cortical pattern, favorable to the performance of a task. Yet for these authors, this effect is attached by the bombardment of the retina and the olivary nucleus through photic and auditory stimuli at a specific frequency, which causes a standardization of the cortex in a frequency that is compatible with a brainwave, when perceived through the thalamus. Thus, the photic and auditory stimulation can be classified as a type of deep stimulation because its effects into the cortical level will occur through the structures of the brainstem and the thalamus . Therefore, this study aimed to seek scientific research that used the photic and auditory stimulation as a way to enhance cerebral activity. The methodology of this study follows the PRISMA model (preferred reporting items for systematic reviews and meta-analysis) for the determination of eligibility. 1- Type of studies – The studies were randomized clinical trials, prospective cohort studies, cross-sectional observational studies, and case-control studies to generate evidence regarding the effects and impact of photic and auditory stimulation in the treatment of psychomotor sequels. 2- Types of participants – No limitation in terms of age and gender but with one or more associated pathologies. 3- Type of intervention – Any type of intervention applied in humans and associated with brain stimulation by light and sound. 4- Types of measures – Level of motor skills, functional autonomy, brain processing speed, focused attention, and reaction time. 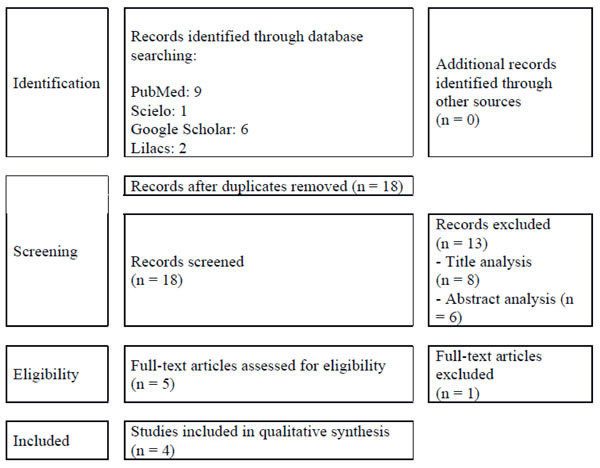 The articles included in this study were selected on searches in the database PubMed, Scielo, Lilacs, and Google Scholar in May 2014, without restrictions in any of the databases. From own references found in the electronic databases, a manual search was also performed. All searches in the database used the terms "stimulation by light and sound," “brain increase,” and “human” in both Portuguese and English languages. The selection of studies was conducted by two independent authors that sought a consensus in case of disagreement. The evaluation consisted in the filtering of the studies, from the analysis of the title, followed by summary and analysis. To solve possible disagreements between the two experts, a third evaluator was requested for the due order. Complete relevant articles were obtained and evaluated with inclusion and exclusion criteria described below. The following data were extracted from the articles: sample size, characteristics of participants, type of intervention, and meaningful main results. In addition to these, several other information about methods and results were collected. These procedures were performed by two independent investigators, who have reached a consensus in the case of divergence. The articles used drugs in their interventions, which did not implement the visual and auditory stimuli as a way to optimize brain activity and which have drawn on animal models in research development. Among the possibility to stimulate brain activity, the light and sound are the least clinically tested. Therefore, the production of a systematic review can seem to be premature because of evident lack of scientific studies that used light and sound stimulation in their interventions. However, the published studies in other areas of knowledge indicate that application of brain stimulation by light and sound produces a mental state that improves the effects of different interventions. Furthermore, this research does not claim to indicate the brain stimulation by light and sound as an efficient technique to be used in combination with interventions in the mental health field. The aim with this systematic review, despite apparent limitation by the lack of studies, is to provide researchers with mental health access to the results produced through the application of brain stimulation by light and sound, and thus, stimulate interest for this technique is more widely tested in the mental health area (Fig. 1). Within the included studies for qualitative synthesis, three were experimental studies, and one was a case report. In this way, the first study selected, after applying the criteria defined in the methodology, used the photic and auditory stimulation associated with motor practice. In this study, Vieira  observed the effects of photic and auditory stimulation associated with a complex motor practice in mental functions of 37 individuals, both genders and ages between 68 and 78 years, with Alzheimer’s disease. The sample was randomly divided into 3 groups that received different levels of stimulation. The first of those groups received the photic and auditory stimulation associated with practice of psychomotor activities dependent on high levels of memory. Another group participated in a psychomotor training associated with a placebo of photic and auditory stimulation. Finally, the third group of the study maintained the common treatment applied to patients with Alzheimer’s disease and received the photic and auditory stimulation. The results obtained after training show a gain in cortical performance of the overstimulated group when compared with the less stimulated one, with an increase in the cortical activity in specific regions of the brain as presented in brain mapping results (EEG). Another study conducted by Calomeni and colleagues  verified the effects of photic and auditory stimulation associated with imagery in the heart rate variable. For this, the authors stimulated a frequency of 20 Hz (beta wave) in the cortex of 10 sportsmen, with mean age 14 ± 0.7 years. The total time of stimulation was 10 minutes and was requested from individuals that mentally simulate (imagery) situation that occurs in training and normal games. All process of stimulation occurred 1 h before the start of a training routine, which guarantees the absence of stressors related to training or competitive situation. Even under these conditions, the results show physiological adaptations even without the influence of these stressors. In the same sense, Ribeiro Júnior et al. observed the effect of photic and auditory stimulation in the variable reaction time and skilled motor-cognitive efficiency of 20 football players. The athletes were divided into two groups of 10 individuals that performed a task: kicking a ball in a specific quadrant marked in the goal area in response to a random light stimulus. The performance in the task and the speed of mental processing through the motor reaction time were evaluated, that is, the time that each athlete lingered to identify and hit the indicated quadrant by light signal. In the treatment, the soccer players who formed the experimental group had brain activity equalized at 11 Hz (alpha wave) during 20 minutes by a period of 2 weeks. The results show that the experimental group obtained significant gains in improving the reaction time when compared with the control group, and inside the experimental group, the combined training produced significant improvements if compared pretest and posttest. In the last study included for systematic review, Calomeni et al. conducted a case study that applied the photic and auditory stimulation associated with the imagery to produce a functional improvement in deteriorated movement patterns as a result of stroke. To achieve this objective, the studies stimulated the alpha brainwave in the frequencies 8, 9, and 11 Hz alternately in 4 subjects of the sample, associated with the mental practice of motor gesture evaluation (imagery) and the visualization of people performing the same movement without any functional limitations. After the 12 30-minute sessions of the proposed intervention, it was found that all individuals evaluated achieved significant gains in the function of the motor gesture evaluated both in terms of runtime as the functional quality of movement. According to the authors, this means that the intervention proposed in the study can be used as an adjunctive therapy in the recovery of motor sequels through increasing the efficiency of neuronal function (Table 1). Summary of the effects of photic and auditory stimulation work. AntÔnio Moraes To investigate the functioning of brain frequencies comparatively to the performance of a task and the potential for memory in individuals with Alzheimer’s disease. 37 Experimental study The results obtained after training pointed to a gain in cortical performance of the group over stimulated, compared with less stimulated, being confirmed increase in cortical activity in specific brain regions depicted in the results of brain mapping (EEG) in the stimulated groups. The groups participated in psychomotor tests with high cognitive analysis, as well as recognition of spatial/temporal positions of objects and the body on the previously seen environment. Two of the groups underwent a stimulation protocol by light and sound. Data on the cortical activity for motor EEG and cognitive and skillful performances were evaluated before and after the program of training of the cortical activity by light and sound. et al. To check heart rate variation of young athletes caused by a session of photic and auditory stimulation associated with imagery in a training session. 10 Experimental study The proposed intervention produced physiological adaptations even in the absence of physical movement and real sporting emotions. Brain stimulation by light and sound in a frequency of 20 Hz associate a protocol of mental simulation. The heart frequency at different moments was assessed. Ribeiro JÚnior et al. To verify the effect of cortical stimulation on reaction time and skill cognitive-motor efficiency among soccer players. 20 Experimental study The experimental group obtained significant gain in improvement of reaction time when compared with the control group. The group that received the combined training obtained significant improvement when compared before and after the test. It was concluded that through the combined training, motor learning can be improved for several areas in terms of knowledge and sports. Alpha waves were stimulated through light and sound by 10 sessions of 20 minutes associated to mental training of a specific motor action of football. The success rate at motor action and the reaction time was assessed. et al. To check the effects of brain stimulation associated with imagery, as biofeedback training for the recovery of motor functions deteriorated by stroke. 4 Case report The results show improvement in performance of task, both in the execution time and in the functional quality of movement, and it is concluded that the improvement is more related to the increase in the efficiency of neuronal function. The training period comprised 12 sessions of 30 minutes of stimulation by light and sound, as well as imaging procedure. The intervention phase was applied three times a week in alternate days. The first dependent variable measured was the level of neuron activity as related to the area where the electrodes were positioned on the head of the patient. The other two dependent variables were the level of functionality of the subject’s upper limbs and the time of experimental task execution. Although the study conducted by França  was not included in the systematic review because of failure to meet the criteria of the adopted inclusion, it represents an important milestone because it sought to develop an inducer of brain waves at lower costs and with greater possibility of customization. Due to bring knowledge that were fundamental to this study. The study conducted by Vieira  proposed the investigation of the behavior of brain frequencies in the performance of cognitive motor skills and the potential memory in individual with Alzheimer's disease. The author justify the utilization of photic and auditory stimulation techniques because of wide applicability to the prevention and treatment of some diseases such as Parkinson's and Alzheimer's disease until the use in training for sportive practice and learning. It was concluded that psychomotor activities associated with photic and auditory stimulation possibly incited neuroplastic processes through new neural interconnections and that this brain's ability to self-organize is also present in elders with Alzheimer’s disease. Differently of Vieira , Calomeni et al. determined whether the photic and auditory stimulation associated with the imagery would produce significant changes in heart rate of basketball players even in the absence of physical stimuli or stressor agents. The authors concluded that, although many studies have agreed with the idea of great susceptibility of heart rate to motor events in potentially stressful situations, no paper has been found that observed the variation of heart rate when the only influencing factor was a mental task, and in this sense, they checked that the photic and auditory stimulation associated with imagery produced significant changes in heart rate even in the absence of physical stimuli or stressor agents and that this effect can be used as a means for preparation of individuals that aim to improve the blood supply before an intense activity or a stressful situation without performing specific physical movements. Still in the sports context, Ribeiro Júnior et al. sought to determine the effect of photic and auditory stimulation in the variable reaction time and skilled cognitive-motor efficiency in soccer players. The adopted procedure produced in the players of experimental group a statistically significant improvement in the motor performance and consequently in the mental processing. Important fact registered by Ribeiro Júnior et al. was that before intervention, the experimental group had lower performance when compared with the control group. After stimulation, the experimental group started to have higher performance compared with the control group. Thus, they concluded that this study opens a great possibility of the emergence of a new technique to motor-cognitive learning, based on the methodology developed, supposing that athletes can have a transfer of the registered gains for any sport that requires improvement in motor efficiency. In a recent study, Calomeni et al. applied the photic and auditory stimulation associated to imagery with the objective of producing a functional improvement on the patterns of deteriorated movements by stroke. At the end of the study, they found that all evaluated individuals have obtained gains on functionality of motor gesture and that these gains are related to the increase in the efficiency of neuronal function. Also, according to these authors, the efficiency of neuronal function is more related to the reduction in the variability of activation of neurons, represented by reduction of standard deviation in the signal of EEG than by the increase on the number of recruited neurons for task, as represented by the increase of electrical activity registered on EEG. Apparently, regardless of the application of the improvement of sportive performance or the physical/mental health provided by analyzed studies to photic and auditory stimulation, the effectiveness of the shown results, which is common for all studies, is based on the fact that the stimuli of light and sound reach the structures of brainstem first. This characterizes the deep stimulation [3, 6, 9] and may explain the changes produced in the brain and inferred through the cortical activity. In this sense, the idea that more studies about this stimulation seems consistent; its applications and consequences could be performed to produce more consistent theoretical and practical stuff about its effects and utility. In the analysis of scientific papers that composed the universe of the study, we can conclude that brain stimulation through photic and auditory stimuli seems to be a noninvasive method to induce specific mental states. In all reviewed studies, the individuals who have passed by brain stimulation associated or not with other strategies they obtained gains when compared to control groups. These considerations suggest the hypothesis that the technique of brain stimulation can be applied to induce favorable mental states to maximize interventions on several disorders that affect humans in a safe and noninvasive method. That is why it seems plausible to suggest that new clinical investigations about photic and auditory stimulation should be developed and that other positive results can possibly arise through the association of photic and auditory stimulation with treatments for mental disorders. Ribeiro Júnior SMS Azevedo MMA, Jorge FS, Morales AP, Silva VF. Efeito da estimulação cortical na variável tempo de reação e performance hábil-motriz-cognitiva em jovens atletas de futebol Revista Motriz 2010; 16(4): 869-79. Siever D. Independent Field Photic Stimulator 1996 United States patent US5709645 1999. Vieira MAM. Efeitos de um programa conjugado da metodologia de luz e som e prática motriz complexa em funções de memória em indivíduos portadores da doença de Alzheimer relações com hemisfericidade Disserta o de Mestrado 151f Rio de Janeiro Universidade Castelo Branco 2008. Bear MF, Connors BW, Paradiso M, Eds. Neurociências desvendando o Sistema Nervoso 2nd ed S o Paulo Artmed. 2002. França RF. Indutor de Ondas Cerebrais por Batimento Binaural Monografia de conclus o de curso de Engenharia da Computa o Curitiba Universidade Positivo 61f 2008. Calomeni MR, Rocha J, Silva AP , et al. Brain stimulation used as biofeedback training for recovery of motor functions deteriorated by stroke Arq Neuropsiquiatr 2013; 71(3): 159-64. Calomeni MR, Almeida M, Arêas NN, Silva VF. Variação da frequência cardíaca durante uma sessão de estimulação cortical e imagética Fit Perform J 2009; 8(1): 5-8. Vernon FS, Maximiliano WOP Sileno MSRJ, Maurício RC, Marcus VMP, André LSS. Acute effect of the cerebral stimulation by light and sound on motor reaction time of young athletes EFDEPORTES Revista Digital 2008 Ano 13 Número 120 [Acessed May 2014] Available from http: //wwwefdeportescom/ efd120/tempo-de-reacao-motora-de-jovens-atletashtm .